Bolivian tin miners from Caracoles run from tear gas during fighting in the Bolivian capital June 7. 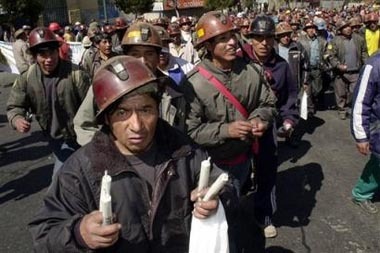 Tens of thousands of workers and peasants surged through La Paz, fighting running battles with police and army. LA PAZ, JUNE 7 – Pitched battles erupted in Bolivia’s capital Tuesday, after last night’s announcement by President Carlos Mesa that he had submitted his resignation to Congress. With a notable escalation of government repression, the fiercest confrontations were between police and miners who occupied the steep streets around the central Plaza San Francisco. Workers, slum dwellers and peasants tried once again to fight their way into the Plaza Murillo, seat of Bolivia’s government. 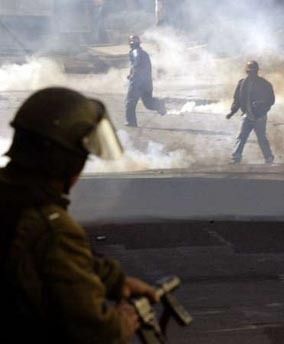 For many hours thereafter, dynamite blasts alternated with the firing of teargas and plastic bullets. The dynamite explosions were even more deafening than yesterday: the miners broke the dynamite sticks into pieces (“cachorros”) that were twice as large as before. Armed soldiers came down from the barracks to occupy Plan San Francisco and “guard” several trucks seized from the miners, saying dynamite and a rifle were found inside. Various demonstrators were hospitalized, reportedly including at least two seriously wounded miners; more than 50 were arrested. In disciplined ranks, miners from the Caracoles cooperative marched down the Prado, the capital’s central boulevard, proudly displaying their dynamite. They were met with applause, as the miners are seen as the embodiment of the history of struggle of Bolivia’s working people. After the vicious privatization of the mines carried out two decades ago, cooperative miners have repeatedly clashed with miners working for wages at private mines as well as those few owned by the government. The fact that both cooperative and salaried miners came out in force today, using their dynamite to hold off waves of police attacks, was highly significant. Streets were torn up and the paving stones – together with wood, tires, street signs and debris – were used to build barricades all along the streets in the old colonial sector of the city, which was enveloped in vast clouds of tear gas. Aymara women in traditional dress were doubled over, vomiting and pleading for water as the gas bit into their lungs. (The effect of the gas is intensified by the thin oxygen at the high altitude.) Street vendors, market women and passersby screamed at the police in outrage at the attack on the demonstrators. In the late afternoon, a woman worker took refuge in a coffee shop with her young daughter after fleeing a new round of gas: “the police fired gas at us just for looking at the miners’ trucks they seized and saying what we thought about it.” Her father and grandfather were miners, she said, and “this whole country used to live off what the miners produced. Now it’s gone and there’s gas, but the Santa Cruz politicians want to grab the money for themselves.” After her husband lost his job, she went to Brazil to work “under lock and key” in a textile sweatshop in São Paulo, but the few dollars she made were taken away by the immigration police. Marching past the transit police barracks, a column of peasants chanted “Fusil, metralla, el pueblo no se calla” – Neither rifles nor machine guns will silence the people. This particular contingent came from Cochabamba, Oruro and areas in Bolivia’s east, which is run like a private fiefdom by the “white” elite lording over a largely indigenous population. Referring to the reactionary heads of Congress and of the House of Representatives, Humberto Vaca Díez and Mario Cossío, the marchers chanted: “Vaca, Cossío, la misma porquería” – Vaca, Cossío, the same crap – and “Vaca al matadero”: Vaca (Cow) to the slaughterhouse. Backed by the Organization of American States (and its master, U.S. imperialism), Vaca Díez insisted today that the presidential succession must be “orderly” and “constitutional,” meaning that he should become president. Next in line are Cossío and the head of the Supreme Court, another associate of the despised former president “Goni” (Gonzalo Sánchez de Lozada), who fled in the face of the October 2003 uprising. What all the bourgeois commentators agree on is that the present “vacuum of power” cannot continue. With the support of key parties from Goni’s coalition, Vaca Díez declared yesterday that Congress will convene in the city of Sucre on Thursday to vote on Mesa’s resignation and who will succeed him, declaring that the “presence of the state” is necessary to “impose order.” In response, Mesa went on national television to plead with Vaca Díez not to take over the presidency because then “we will have a Congress without results, and we could have an explosion” and “a civil war.” Stressing that his own resignation is “irrevocable,” Mesa came out in favor of early elections. While the Santa Cruz senator is the darling of many rightist sectors, others openly prefer a military coup. The idea of Vaca Díez becoming president, and his bellicose posture towards current protests, is viewed by many demonstrators as willful provocation; he is rightly denounced as a partner in all the massacres carried by the megacoalition of rightist and “moderate” bourgeois parties that put Goni in office. As polarization continues to deepen, some middle-class residents in the city center yelled “Indians go home” and other racist insults. Meetings were held in a number of affluent neighborhoods to discuss “defense” against the demonstrators, who in the nightmares of the elite are the reincarnation of the Tupac Katari Indian rebels who besieged colonial La Paz in 1781. Attempts to defuse the conflict through “mediation” continued, with splits among slum dwellers organizations in El Alto regarding negotiations with the government. Meeting with Church leaders preaching the gospel of “dialogue,” Evo Morales, the peasant leader who heads the reformist Movimiento al Socialismo (MAS), declared his support for early elections. Meanwhile, the La Paz daily La Razón (7 June) reported that “as a result of pressure from its base,” the MAS had “hardened” its position to come out for nationalization of oil and gas – the predominant slogan in these days’ protests – while asking for “the formation of a pre-Constituent Assembly.” In other words, a body even more impotent than the empty Constituent Assembly Morales has demanded over the past years. On the radio, in the midst of today’s battles, constant advertisements funded by “NGOs” (supposedly “non-governmental” organizations actually funded by imperialist agencies) extol the virtues of the promised Constituent Assembly, for Indians, for women, for youth, etc. Denounced by mouthpieces of U.S. imperialism, Morales has sought to prove his respectability and “reliability,” seeking support from the NGOs as well as European social democrats, Lula’s popular front in Brazil, and Hugo Chávez of Venezuela. One of President Mesa’s last acts was to call mid-October elections to a Constituent Assembly linked to a referendum on the ultra-reactionary demand for “autonomy” of Santa Cruz and other oil and gas-rich areas whose rulers want more dollar profits for themselves. The eastern bourgeoisie has repeatedly opposed even token juridical recognition of the existence of multiple ethnic groups in Bolivia, whose Aymara, Quechua, Guaraní and other indigenous peoples have been brutally oppressed for centuries. Today’s bitter escalation of class battles gave the lie once again to the democratic illusions spread by Morales and others, including centrists on the left (see “Bolivia Explodes in Sharp Class Battle”). Even as the right wing demonstratively held off reconvening Congress, the MAS parliamentary delegation showed up anyway, just to demonstrate their loyalty to the “institutional” framework that has proven incapable of fulfilling even the most elementary needs of the masses. On the streets, in the markets, in taxis, everywhere, Bolivians speak with contempt of Carlos Mesa as the president “que no pudo” – who couldn’t. The “instability” convulsing this country (and much of Latin America), is not fundamentally caused by passing political phenomena. The convulsions are caused by the capitalist system, which is manifesting growing instability on an international scale. Today’s confrontations ended in a new impasse. On the streets people meeting each other for the first time ask “What is the way out? Why is nobody showing what needs to be done?” While the masses are enraged at the bourgeois government, they are still asking it to solve the nation’s problems, notably through nationalization of oil and gas. In the absence of revolutionary leadership, they have not reached the awareness that the working masses themselves are the only ones who can begin to solve these problems: this means the proletariat taking power at the head of all the oppressed. Workers and peasants defense groups (the basis for workers and peasants militias) are a burning necessity of the day, as is the formation of workers, peasants and soldiers councils to organize the exploited and oppressed masses in struggle. These councils could then form the basis for a worker-peasant-Indian government.